I'd like to say a very big thank you to all the staff and pupils I met at Churchfields Junior School, who I had the great pleasure of visiting last month! 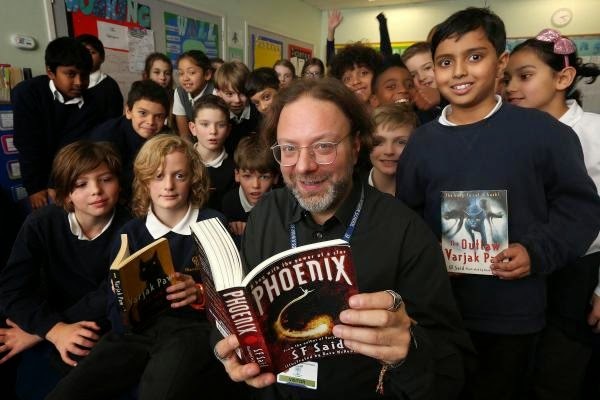 It was an especially exciting visit because Churchfields have been studying Varjak Paw for many years now, so almost everyone in the school had read it. It was fantastic to meet you all, and to hear such inspiring enthusiasm for reading and books. The local newspaper even wrote a story about it! We didn't have enough time to answer all the questions that everybody had, so if anyone would like to ask me another, or to say anything about the visit or my books, this is the place to do it! And in the meantime, here's the Phoenix book trailer again..